NTC thermistors have been used for different applications (limited by a low Currie point around 150°C), such as temperature sensors, elements for time delay, infrared detectors, voltage regulation, fan control etc. 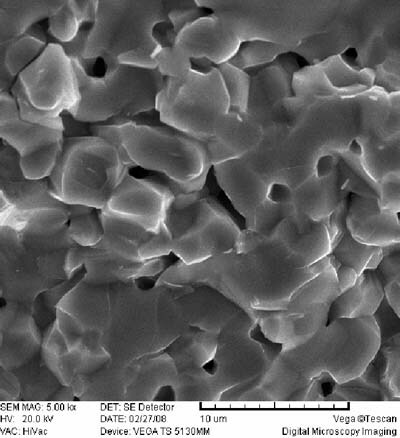 They remain materials of great interest mainly in microelectronics and optoelectronics. 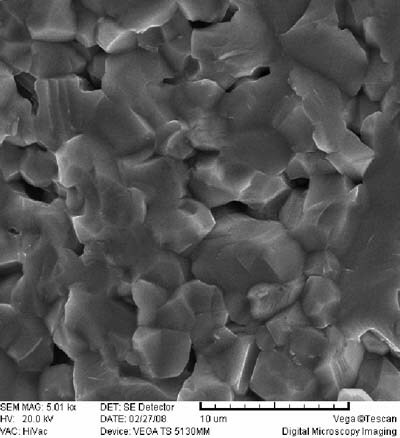 Nickel manganite, NiMn2O4, consisting of 3d transition metals, has been widely used as a material for negative temperature coefficient (NTC) thermistor devices. 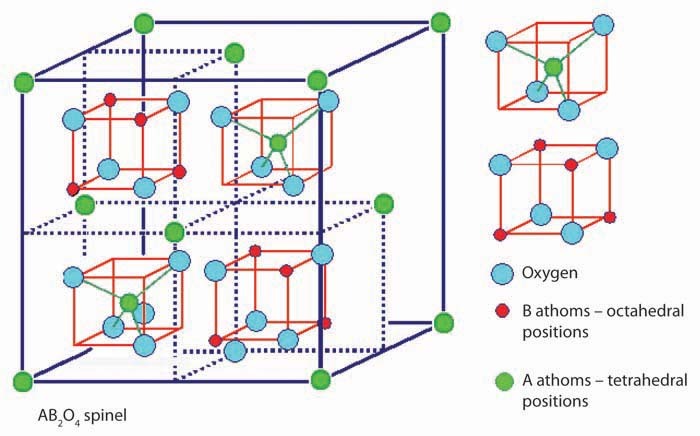 It is well known that nickel manganite is a ferromagnetic material and has an intermediate (partially inverse) cubic spinel structure (Fig.1). The values of the cation inversion parameter range between 0.8 and 0.88. This parameter largely determines all physical properties of the material. The electrical conduction mechanism in nickel manganite is commonly described as phonon-assisted electron jumping (the so-called hopping) between Mn3+ and Mn4+ cations placed in octahedral sites. where is the resistivity of the material at infinite temperature, T is absolute temperature, and B is the temperature coefficient of resistivity, given in dimension of temperature (in Kelvin). Resistivity is strongly affected by the composition and method of preparation of transition metal oxides. 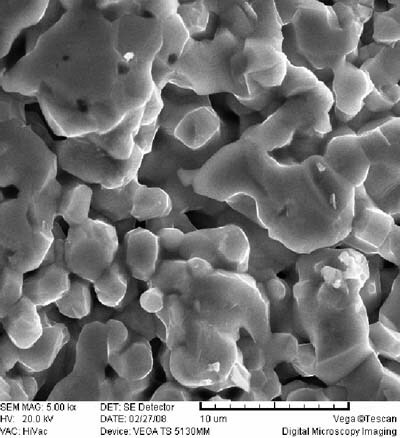 Many authors have attempted to define the relationship between the structure, microstructure, thermal and electrical properties of the sintered material used as the starting material for the production of sensitive NTC thermistors. 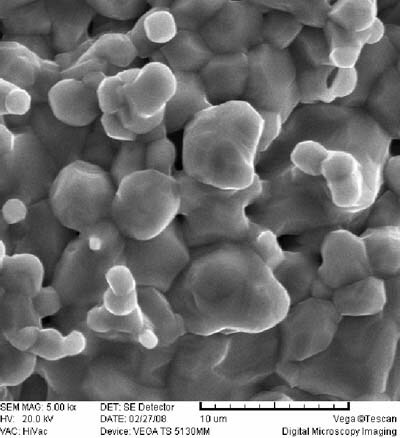 In our earlier studies we investigated the influence of the time and temperature of sintering on thermal, optical and some electrical properties of this material [1-3]. The main purpose of our recent investigation has been to show the non-negligible influence of mechanical activation of the starting mixed oxides on electrical properties (direct current (DC) resistivity in our case) of the formed nickel manganite . 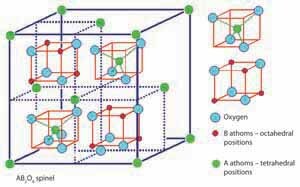 Mechanical activation has great advantages over other processing techniques: in the first place, it enables us to produce more homogeneous materials. This technique increases the number of carriers and intensifies transport processes. 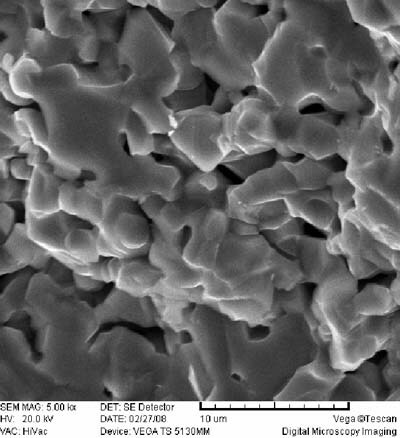 Apart from the time and temperature of sintering, it is very important to optimize the time of mechanical activation, since short mechanical activation does not provide enough energy to improve material properties, whereas too long activation time leads to the formation of microstructure defects, affecting the number of carriers and conductivity (resistivity) of the material. 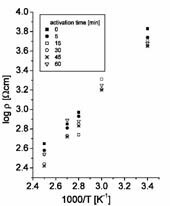 A very long activation period ultimately leads to higher nanoparticle agglomeration, resulting in increased porosity (Fig. 2). It is shown that thermistors may have different electrical properties that can be controlled by changing the conditions of sintering and the time of mechanical activation. It has been noticed that the intrinsic resistivity decreases with the increase of the sintering and environment temperature, as a consequence of carrier number growth, which ensures higher conductivity, hence decreasing the resistivity of the material. Short-time mechanical activation results in reduced grain size and porosity and increased sample density, leading to the reduction of the material's electrical resistivity. 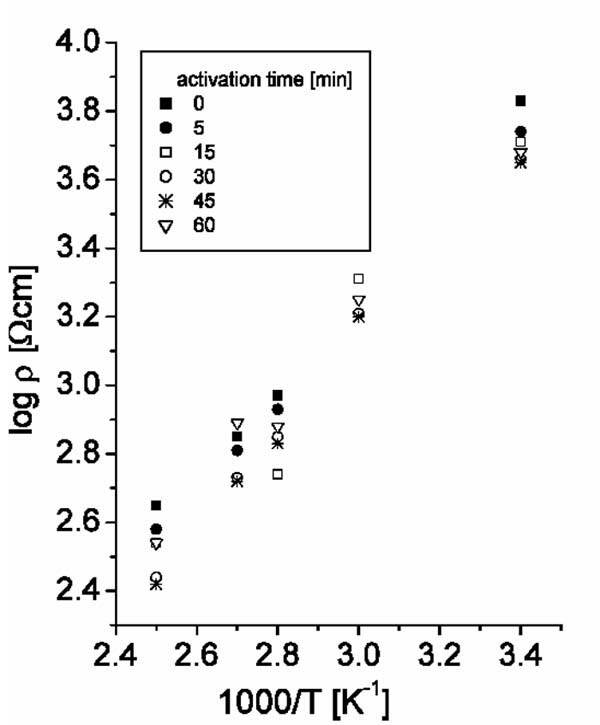 Longer activation periods increase porosity and, consequently, decrease sample density. 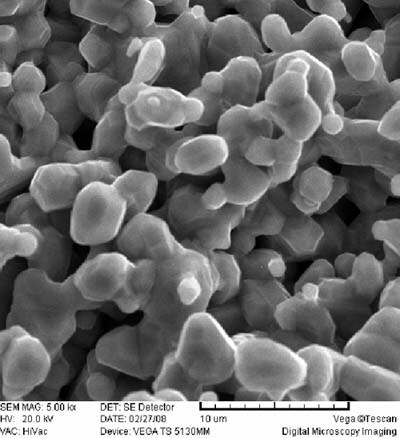 Furthermore, it has been shown that the preparation route of multi-component transition oxides (mechanical activation - in our case) influences electrical properties - B constant and different transport properties of nickel manganite. 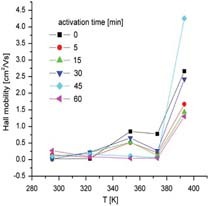 The mobility, resistivity and average Hall coefficient of nickel manganite samples obtained by sintering powder mixtures that were additionally mechanically activated for various time periods were measured and compared at different temperatures – room temperature, 50, 80, 100 and 120°C for an applied field of 0.37 T.
Figure 3 shows the relationship between the specific electrical resistivity ( ) and temperature (T). 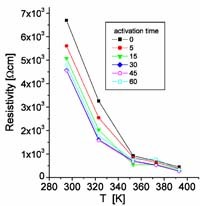 The resistivity decreased exponentially with temperature increase for both the non-activated and activated samples. It was also noticed that the resistivity of non-activated samples was higher than that of mechanically activated samples. This is the consequence of carrier number increase induced by additional mechanical activation. 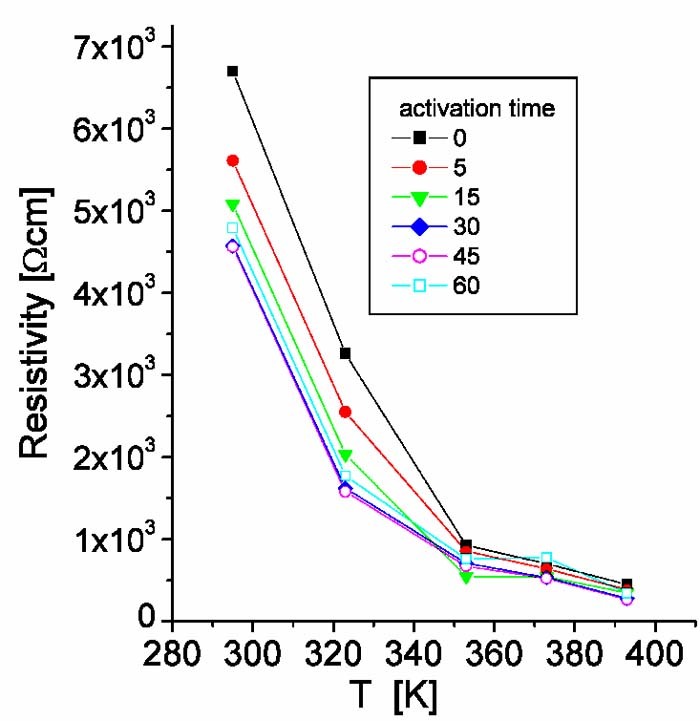 The relationship between the function log and the reciprocal of absolute temperature (1/T), for NiMn2O4 samples activated for different time periods is shown in Fig. 4. There is an obvious linear dependence of log on the reciprocal of the absolute temperature (1/T), and it is in accordance with the well-known exponential law described by Eq. 1, confirming NTC characteristics of this material. The mobility calculated from Hall measurements was found to increase with temperature increase (Fig. 5). 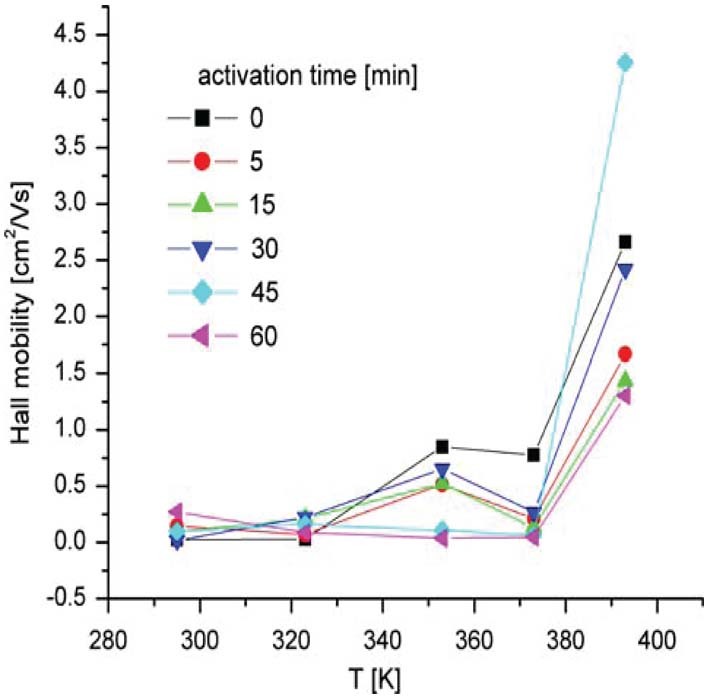 The fact that mobility increases with the increase of temperature and longer mechanical activation period verifies and supports the small-polaron hopping mechanism. In our case, the mobility is higher than literature values since mechanical activation causes the mobility increase. where k is the Boltzman constant. It was shown that electrical properties of thermistor materials sintered at 1200°C and mechanically activated for different time periods differ and can be controlled by variation of those parameter, which ensures broad applicability of such thermistors. Nickel manganite in the form of thick film was used for the manufacturing of an anemometer. In cooperation with colleagues working at the Institute for Multidisciplinary Research in Belgrade, a novel uniaxial anemometer  was created using a NTC thick film segmented thermistor to measure wind speed and direction. The anemometer operated on the principle of heat loss caused by the air volume flow and air speed. A NTC segmented thermistor served as a wind sensor in the anemometer. It was self-heated by a DC constant voltage. The self-heated DC current through the thermistor was changed by heat loss due to resistivity changes. The wind speed was varied from 1 to 15 m/s for different input air temperatures in the range of -20 to +40°C. The wind direction was determined by measuring voltage differences on the inner electrodes of the NTC segmented thermistor. The air temperature was measured by a cold NTC thick film segmented thermistor calibrated in the claim chamber. Anemometer's inertia was measured at room temperature (at 25°C) and normal room humidity (at 50%). The obtained results enable fast optimization and implementation of an uniaxial anemometer in a 3D anemometer. The most recent research in this field at the Institute of Technical Sciences of SASA focuses on the testing of a new type of nickel manganite thick film thermistor for water flow sensor applications. The main idea is to thermally connected a sensor to the heat exchange layer with a capillary enabling cooling by water flow. The thermistor sensor is self-heated with a constant voltage (DC power supply). The thermistor current was measured as a function of water flow and input water temperature. The water flow sensor actually operates on the heat loss principle, and is thermally insulated by the air surrounding the sensor and a chamber (housing of styropore foam). Calibration was performed at room temperature using an ice/water mixture to measure the range of the sensor's sensitivity. The sensor stability and inertia were also analysed. Savić, S.M., Aleksić, O.S., Nikolić, M.V., Luković, D.T., Pejović, V.Z. & Nikolić, P.M. 2006, "Thermal diffusivity and electron transport properties of NTC samples obtained by the photoacoustic method", Materials Science and Engineering B: Solid-State Materials for Advanced Technology, vol. 131, no. 1-3, pp. 216-221 (doi:10.1016/j.mseb.2006.04.035). Savić, S.M., Aleksić, O.S., Nikolić, P.M. & Luković, D.T. 2006, "Geometrical and electrical properties of NTC polycristalline thermistors vs. changes of sintering parameters", Science of Sintering, vol. 38, no.3, pp. 223-230. Nikolić, M.V., Paraskevopoulos, K.M., Aleksić, O.S., Zorba, T.T., Savić, S.M., Blagojević, V.D., Luković, D.T. & Nikolić, P.M. 2007, "Far infrared reflectance of sintered nickel manganite samples for negative temperature coefficient thermistors", Materials Research Bulletin, vol. 42, no. 8, pp. 1492-1498 (doi:10.1016/j.materresbull.2006.11.005). Savić, S.M., Nikolić, M.V., Aleksić, O.S., Slankamenac, M., Živanov,M. & Nikolić, P.M. 2008, "Intrinsic Resistivity of Sintered Nickel Manganite vs. Powder Activation Time and Density", Science of Sintering, vol. 40, no. 1, pp. 27-32. Savić, S.M., Stojanović G.M., Nikolić, M.V., Aleksić, O.S., Luković Golić, D.T. & Nikolić, P.M. 2008, "Electrical and transport properties of nickel manganite obtained by Hall effect measurements", Journal of Materials Science: Materials in Electronics, doi: 10.1007/s10854-008-9710-5, pp. 1-6. Menićanin, A.B., Aleksić, O.S., Nikolić, M.V., Savić, S.M., Radojčić, B.M., "Novel Uniaxial Anemometer Containing NTC Thick Film Segmented Thermistors", Proceedings of the 26th International conference on Microelectronics(MIEL 2008), NIŠ, SERBIA, 11-14 May 2008, Vol 2, pp. 349-352.